Planning to serve Brussels sprouts? Then you’re probably already headed for the stove, right? But wait. These little choux taste great raw. Just slice them thinly (it brings out their natural flavor) and toss them in something tasty. Like hearty hot bacon dressing, we would suggest. It’s particularly nice if you’re experiencing cool fall weather, as many of us are now in the US. And if you’re having trouble selling some diners in your household on the whole idea of Brussels sprouts—well, just wait until they taste them in this robust dressing. You may make some cabbage converts. Lots of vegetables that are traditionally cooked (and served as sides) work well when “shaved” (i.e., sliced thinly or chopped) and served raw-with-dressing as first courses. Chopped Kale salad is a hot restaurant menu item these days, for example. Shaved Fennel salad is equally tasty. Shaved Brussels sprouts fit right into that trend. 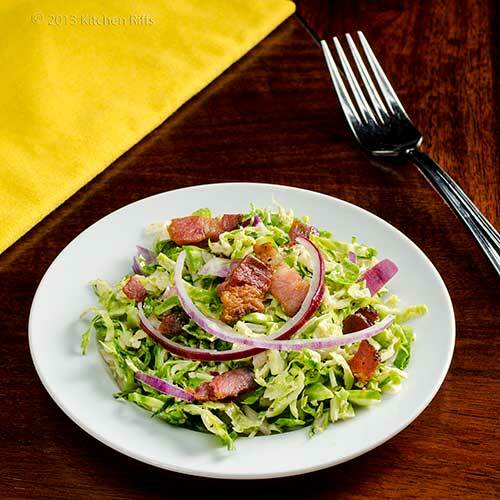 The dressing we use here is the one made famous by the classic Spinach Salad with Hot Bacon Dressing. Because this salad needs to be served while the dressing is still hot (or at least quite warm), you’ll want to toss it at the last moment. But you can do the most time-consuming part—shaving the Brussels sprouts—hours ahead if you wish. Just put the shaved sprouts into an airtight container after you cut them, and refrigerate until needed. See Notes for another tip about preparing the bacon ahead of time. This salad tastes best if you shave the Brussels sprouts as thinly as possible (paper thin is great, but not necessary). Shaving them is easiest if you use a kitchen slicer or a mandoline. But be careful! Those blades are sharp. If your device has a guard, use it. To slice with a mandoline, grab a Brussels sprout by the stem, and apply the tip of the sprout to the blade, slicing crossways. Keep slicing until you decide that the blade is getting too close to your fingers for comfort (you won’t be able to use the entire stem end of the Brussels sprout). You can also slice Brussels sprouts with a very sharp knife (one with a thin blade is best). Just hold the Brussels sprout by the stem end and cut crossways, starting at the tip and slicing as thinly as possible. It’s easiest if you cut a small slice off one side first to form a flat base so the sprout doesn’t roll around. Prep time for this recipe is 15 to 20 minutes, cooking time another 15 or so. This recipe yields 4 to 6 first-course servings. Peel or trim away any discolored outer leaves of the Brussels sprouts, then wash and dry them. Slice (shave) the Brussels sprouts as thinly as possible (see recipe headnote for instructions on how to do this). Place the shaved Brussels sprouts in a large, heatproof bowl. Slice the bacon into pieces of an inch or less. Place the bacon bits in a large, cold frying pan. Put on stovetop and turn heat to medium. Slowly fry the bacon until crisp (10 to 15 minutes). While the bacon is frying, peel the red onion and slice thinly (or chop into thin pieces of about ½ inch). Add the onion to the bowl with the Brussels sprouts (you may want to reserve a few pieces of onion for garnish). When the bacon pieces are crisp, remove them from the frying pan with a slotted spoon and set them aside to drain on a paper towel. Carefully taste the dressing (it will be hot). Need some seasoning? Add salt and pepper. Not enough vinegar? Add some. Want a little extra kick? Stir in the Dijon mustard (if you haven’t already). Kinda on the tart side? Add a little sugar, and stir to dissolve. Pour the hot bacon dressing into the bowl containing the Brussels sprouts, and toss briskly (tongs work well for this). The hot dressing will flavor the Brussels sprouts and wilt them just slightly. Divide the salad onto serving plates. Garnish with the reserved bacon bits and thin slices of red onion. Serve. At table, you may want to add additional freshly ground black pepper. Because bacon provides so much flavor in this dish, you want to use a good-quality brand. I prefer thick-cut bacon (so the pieces have some heft), and like to use one with a pepper coating. But an applewood (or other) flavoring would be pleasant too. This recipe is quite heavy on the bacon; you may want to use a bit less (although not less than 4 ounces of bacon, IMO). The thinner the Brussels sprout slices, the better this salad tastes. If you can get the slices paper thin, that’s wonderful. But even if they’re thicker than that—mine always are—it’s still good. I can’t overstress how dangerously sharp many mandolines and kitchen slicers can be. So watch your fingers—you want to keep all of them. Not a big fan of raw onion? There’s an alternative way of using onion in this dish. At the beginning of Step 5, before you add the vinegar, just add most of the onion (save a bit for garnish). Sauté the onion in the bacon fat for a couple of minutes, then add the vinegar and proceed with the recipe. Although I list Dijon mustard as optional, it really does improve the flavor of this dressing. I usually add it to the pan in Step 5, along with the vinegar. If you’re not sure you want to use it, just leave it out in this step and decide whether to add it when you taste the dressing in Step 6. I almost never use sugar in this recipe—but then I like tart flavors. Feel free to experiment with the quantity of sugar to see what suits your tastebuds. I like to use Kosher salt in most recipes. But if you don’t have that on hand, you can use plain table salt (though I’d reduce the amount by about half since table salt is finer and more “condensed” than Kosher). Want to do as much salad preparation as possible ahead of time? As mentioned in the recipe headnote, you can shave the Brussels sprouts (Step 1) several hours ahead (possibly even a day ahead, although I’ve not tried that). You can also sauté the bacon ahead of time (Step 2). Just set the cooked bacon pieces aside as directed (if it’s going to be for more than an hour or so, you may want to refrigerate them; then simply warm them in the microwave for a few seconds before using to take the chill off). Also, set aside the frying pan containing the bacon grease. 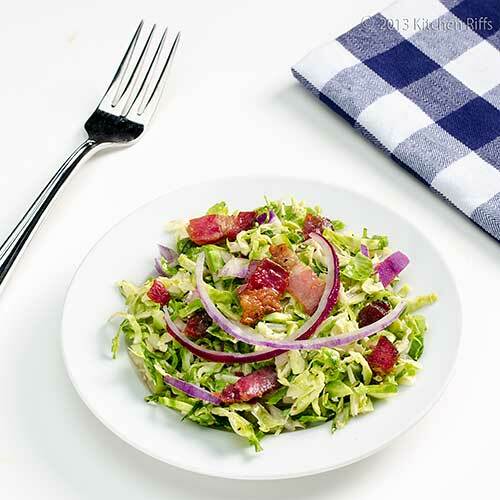 Then when you’re ready to prepare the salad, place the shaved Brussels sprouts in a heatproof mixing bowl, warm the bacon fat on top of the stove, and proceed with the recipe. “Yeah, I’m surprised someone hasn’t made bacon perfume,” I said. OK, she was joking. But eau de bacon still sounds like a killer product. And most guys wouldn’t stand a chance. I've only roasted brussels sprouts, but this sounds like another great way to serve them. I must admit to being just a little afraid of mandolines, so I'd probably go with the knife method! Either way, this dish looks amazing. I love brussels sprouts raw in a salad. I also use my food processor with the slicer blade (not the grater) and it works out great. Eau de bacon - love it! I have been anxiously awaiting this recipe since you mentioned it to me. My Brussels sprouts lovers in my family will be delighted with this. Thanks for the recipe! I'm hoping the current generation of cooks know better than to boil these beauties. Well, many just avoid them because of how their moms destroyed them...so it's a learning experience still! Everything is better with bacon, right? Hi Beth, roast sprouts are great! Mandolines really are scary (and dangerous!) so I don't blame you from staying away from them. For anything up to a pound of Brussels sprouts, I use the knife method myself. Thanks for the comment. Hi Laura, I should try the food slicer blade on my food processor sometime - I just assumed it wouldn't slice them thin enough, but I didn't try it. Thanks for the tip! And the comment. Hi Karen, this is a really fun recipe to tinker with and make it your own. Enjoy! And thanks for the comment. Hi Barb, I certainly have vivid memories of over-cooked Brussels sprouts! It took me years before I began to appreciate them. Now they're one of my favorite fall veggies! And when in doubt, apply bacon. ;-) Thanks for the comment. I recently had roasted Brussel sprouts for the first time and loved them. Prior to that I disliked them tremendously. This though sounds delightful! Hi Vicki, roast Brussel sprouts are so good, aren't they? My favorite way of preparing them. Thanks for the comment. Hi Karen, that is a bit, isn't it? ;-) You do want plenty of drippings though. Thanks for the comment. Your created a great way to eat brussel sprouts, I believe it's one of the best way to enjoy the vegetable. Looks so yummy and delicious. Hi Asha, this is really a tasty dish. And one many people will like, I think. Thanks for the comment. John you caught my attention with this dish. I think the bacon will win my son over. Thanks! Sounds great, John! Perhaps if I don't tell Peter they are BS, he will eat them? This sounds delicious and would be a perfect salad course for a dinner party! I am so glad more people are discovering the love of Brussels sprouts. After being so maligned for so long, it's nice to see this veg getting the limelight. I totally agree...I know my husband and everyone I know will love this salad. I've always loved Brussels sprouts... I think it's because I was lucky enough to have a mother who knew how to cook them to their crunchy green perfection rather than boiling them into greyish green mush! This dish looks absolutely perfect. I love the combination of Brussels and bacon (so does my husband, though he hated Brussels sprouts for a long time before that!) and the dressing sounds fantastic. Definitely trying this now that the weather is warming up here in Australia! Yum! :-) It's not particularly healthy, but it is particularly good! Hi Lydia, bacon is a food group all by itself, isn't it? ;-) Thanks for the comment. Hi Lizzy, cover them up with bacon and he'll never notice! Thanks for the comment. Hi Alyssa, it's really an excellent dish. Plus it's a little bit different, which is always nice. Thanks for the comment. Hi Carolyn, don't Brussels sprouts have great flavor? I used to hate them when I was a kid, but they were usually overcooked. Lightly cooked (or raw)? Wonderful! Thanks for the comment. Hi Nee, happy to be just in time! Thanks for the comment. Hi Laura, properly cooked Brussels sprouts are heaven, aren't they? The dressing on this really is good, and worthy trying. IMO, of course. ;-) Thanks for the comment. Hi Charlie, they're fun when they're raw. They actually don't have quite a much flavor as when properly cooked, but the dressing more than makes up for that. And their crunch is terrific! Thanks for the comment. I'm always looking for a new way to enjoy Brussels sprouts, this looks wonderful!! Great job! What a lovely salad. It's that time of year when all I want is a fresh, tasty salad. It might be wintery for you but this would make me happy right this minute. I love anything with bacon dressing! And this salad is a perfect accessory! I made a Brussel sprout salad for someone last year and told them it was cabbage. They ended up loving the salad and conquered their fear of the evil sprout! I'm all about lying when it comes to people eating my food! Damn, look at that salad color! beautifull captured and gosh, the bacon made me drolling..
i love the renderred bacon dressing ! I thought it was lettuce at first when I saw your picture... Can't really imagine myself eating raw Brussels sprouts? Now after reading, I'm telling myself... I have to try this. This recipe really got my attention. I never thought of using Brussels sprouts in a salad. Everything about this salad and salad dressing sounds delicious! Hi Raymund, isn't this nice? Looks great, tastes better! ;-) Thanks for the comment. Hi Dan, the more I play with Brussels sprouts, the more I like it. It will combine with almost any flavor you can think of! Thanks for the comment. Hi Maureen, it's never truly wintery when you can eat good stuff like this! ;-) Thanks for the comment. Hi Abbe, bacon does that to us, doesn't it? Its flavor just makes us weak at the knees. And yeah, lying works - particularly when it's for your guests own good! ;-) Thanks for the comment. Hi Dedy, isn't the color nice? Once you strip the dark green outer leaves off of Brussels sprouts, you'll find much lighter green underneath. Thanks for the comment. Hi Zoe, it does look a bit like lettuce, doesn't it? And no, I couldn't imagine myself eating raw Brussels sprouts - until I did it! Slice them thin and they're wonderful. Thanks for the comment. Hi Dawn, most of us, myself included, usually cook Brussels sprouts. And they're good! But this salad is well worth making. Thanks for the comment. Everything is better with bacon! This is a lovely salad John. Delectable! A scrumptious salad! Very original too. I love Brussel sprouts and this is a great way of preparing them. Hi Simone, my mom did the same thing to those poor little Brussels sprouts! And it took me forever to like them (same with Mrs K R). Now they've become one of my fave veggies. Thanks for the comment. Hi Anne, bacon really does make everything better, doesn't it? ;-) Thanks for the comment. Hi Rosa, this is such a fun dish, and a bit different. Really delish. Thanks for the comment. Hi Asmita, isn't this nice? I love it! Thanks for the comment. LOVE shaved raw bsprouts!! Especially when doused with hot bacon. Yum!! I love Brussel sprouts.. This looks delicious !! Woah! My kids would be so thrilled to eat brussel sprouts this way. Sounds wonderful! Raw Brussels sprouts salads are one of my favorite things! So delicious. Adding bacon dressing sounds fantastic! I love buying the stalks of sprouts. I LOVE Brussels Sprouts, John. I actually liked them when I was a kid and the "rule" was to boil them for hours. Phew! That smell:) I have recently discovered roasted brussels sprouts and will never look back. I, however, have never tried them in a shaved. Now that you mention it, it makes so much sense. Aren't they in the same family as cabbage? Brussel sprouts don't find their way to my kitchen--- except yesterday. My daughter is in town and one of the vegies we bought at Trader Joe's is yes... brussel sprouts. I don't quite remember when was the last time i ate brussel sprouts. All i could remember is that I didn't quite enjoy it because you are right, it's over boiled and it has an odor that I dislike. I have a pack of brussel sprout in my fridge, thankfully this recipe will come in handy! Hi Kiran, aren't they great? I love their texture. And bacon makes everything better! Thanks for the comment. Hi Sowmya, if yui love Brussels sprouts you'll really enjoy this dish! Tons of flavor. ;-) Thanks for the comment. Hi Kate, there's a kid in all of us that would love this! Really a nice dish. Thanks for the comment. Hi Laura, aren't raw Brussels sprouts wonderful? And bacon dressing is always a good thing. ;-) Thanks for the comment. Hi Louise, Brussels sprouts are indeed in the cabbage family. And we all know how good "shaved' cabbage is in coleslaw! Roast Brussels sprouts are terrific, and I really like your idea of grilling them. Thanks for the comment. Hi Malou, this is a good recipe for a Brussels sprouts hater. Roasted is another one. But Brussels sprouts are pretty good in anything, as long as you don't overcook them! Thanks for the comment. I was going to roast my Brussels sprouts, but I may have to re-think that! A local restaurant is famous for their shaved Brussels sprouts salad..it's terrific as I know yours is, too. Hi Liz, roast Brussels sprouts are pretty good! As are these. This bacon dressing is a terrific dressing, and a Caesar-style dressing would be pretty good too, IMO. Thanks for the comment. After a long spell of hating Brussels sprouts (school ruined it for me) I braved them again and I love them! So does most of my family, my husband is a bit negative on the cruciferous veggies. I love how my 8 yr old prefers to eat Brussels sprouts over bread or rice. I know what you men about eating these raw, they are very good. I bet the bacon dressing adds tons of flavour. I can't use this dressing but I make a warm dressing with mustard seeds and chillies, Indian style but it's very good. Thanks John, have a great week! This looks really good! We have a fresh stalk of brussel sprouts from my my father-in-law's garden. 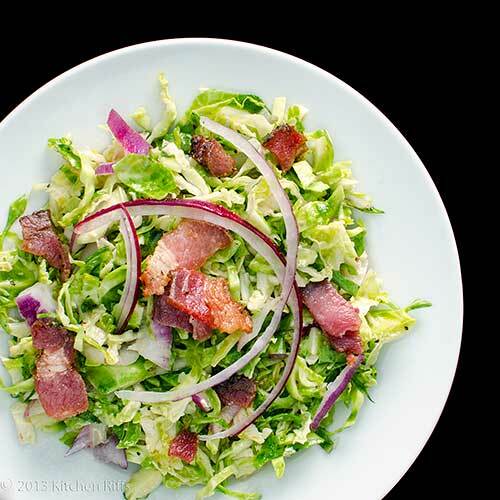 I've made shredded brussel sprouts before, but not raw - this looks really tasty with the bacon dressing! Hi Nazneen, a warm dressing with Indian flavorings sounds outstanding! I gotta try that. ;-) Thanks for the comment. Hi Amy, raw Brussels sprouts really are interesting - wonderful texture and quite good flavor. But I'll eat them any which way! Thanks for the comment. Bacon and brussels sprouts are always such a winning combination! Love the use of hot dressing - with hot dressing I feel like the salad is not a salad any more but a legitimate main course meal! Especially with bacon in it! I not only love the flavor of raw brussels sprouts but I thing they're just beautiful too. Your salad has the best of everything, I'm such a sucker for hot bacon dressing. Hi Greg, my mom never made hot bacon dressing, but I first learned about it in the 70s too. I distinctly remember - my first lunch at Karl Ratzch's restaurant in Milwaukee, and I ordered their spinach salad with hot bacon dressing. Probably 1976 or so. Loved this dressing ever since. ;-) Thanks for the comment. Hi Julia, actually, Mrs K R and I could easily split one of these and just have that for dinner! It's a pretty hearty salad. Thanks for the comment. Hi Chris, I agree raw Brussels sprouts look so pretty! And hot bacon dressing is the best. Thanks for the comment. Now this is very interesting. I'm not a fan of brussel sprouts, but yes, I've only had them cooked, never raw. What a great idea! I haven't found a green that didn't go well with bacon - now it's time to try brussels sprouts. Thanks for this recipe John! Hi MJ, this is a really fun way to try Brussels sprouts. And as you say, every green goes with bacon! Thanks for the comment. Hi Kristi, hot bacon dressing is totally delish! Thanks for the comment. I usually cook them but now I want to try the roasted version. Wow! How good is this!!! I think these would be a real hit around here. I would much prefer them shaved with bacon as opposed to soggy cooked! Excellent idea! Hi John, the bacon sauce is essentially my standard hot bacon sauce that I use on loads of different dishes, including for spinach salad. I do tweak it slightly for each different use - this is a fun sauce to play with - but the tweaks are very minor. Thanks for the comment. Hi Marta, Brussels sprouts are great no matter how you prepare them! Thanks for the comment. Hi easyfoodsmith, how good? Really, really good! ;-) Thanks for the comment. Hi Barbara, nothing worse than soggy Brussels sprouts! And bacon combines so well with them. Thanks for the comment. I really love this one, John! We are such big fans of Brussels sprouts (usually roasted with balsamic and maple syrup), and I think a raw salad would be devoured. We woke up to snow this morning, so a winter-type slaw sounds divine! Hi Hannah, snow?! Brrr! But you're right, this salad would be perfect! Thanks for the comment. i love Brussels Sprouts - it's a normal lunch for me to just roast up a bunch of them to eat - but i hadn't experienced them raw until last Thanksgiving, when i made a raw shaved sprout salad. it was incredible (dijon dressing, but no bacon), but i feel like the warm bacon dressing would make it even better. looks wonderful, thank you! Hi Shannon, I think the combo of Dijon and Brussels sprouts is terrific. Even better with the bacon! Thanks for the comment. So funny you made a raw Brussels sprout salad. When I'm cooking them, I almost always eat a couple raw and I love them. Shaved raw sprouts with bacon dressing?!? What's not to love. 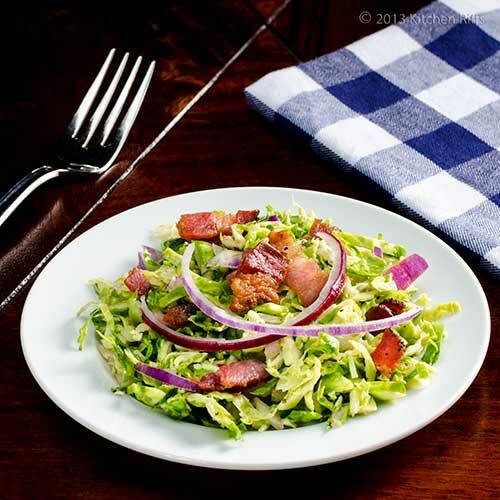 I've made braised Brussels sprouts with bacon but I can't wait to try this raw salad with bacon dressing! Thanks for sharing, John! Hi Bill, don't raw Brussels sprouts have such nice flavor? And bacon takes that flavor over the top! Thanks for the comment. This is a great recipe. My Mom used to make these after we complained about boiling them. Everyone loves this way and we banned all boiled veg. Hi Madonna, aren't overcooked Brussels sprouts the worst? I agree this is such a nice recipe! Thanks for the comment. Hi Cquek, perfect any time! ;-) Thanks for the comment. Hi Bam, the bacon alarm clock is a great idea! There's money to be made in bacon. ;-) Thanks for the comment. I'm so going to try this! I always have brussel sprouts in my fridge this season and never ever get tired of it! Not to mention bacon too. :D I'm all set for this recipe and love the simple dressing! Hi Nami, this is so good - you'll enjoy. And bacon makes everything better. ;-) Thanks for the comment. I always serve salad when I host dinner parties and I try to make the salad different each time to give some variety (and of course impress my guests :) ). I love this salad idea. :) Easy and yummy! Hi Tina, this is a salad that I'll bet most of your guests haven't tasted! Easy and yummy is right. ;-) Thanks for the comment. I love seeing so many recipes for shaved brussels sprouts these days. People who say they won't eat them, do when you can toss them in a salad. This recipe went on my must make for holiday gatherings list. Delicious!! Hi Kristi, shaved Brussels sprouts have such great flavor! I love this dish. ;-) Thanks for the comment. I'm with Mrs. KR on this. I don't know why brussels sprouts get such a bum rap. My family LOVES them! I'm bookmarking this recipe for my next family get-together. Even the little ones will enjoy this! Hi Gomo, I think so many of us had Brussels sprouts that were overcooked by at least half an hour in our distant youth that they're still a tough sell for some. But they're delish, and this salad is particularly nice. Thanks for the comment. Hi Tonette, you'll enjoy! (And no need to spam your blog's URL in your comment - we all know to hover over your name to see your blog). Thanks for the comment. Hi John, look appetizing and great for light lunch. I like the bacon, great combo! Hi Amelia, when I made this, this actually became dinner for us! Couldn't stop eating it. ;-) Thanks for the comment. You never fail Mr KRs. Never. This is beautiful - clean, salty, and a twist on the regular old sprouts. Hi Kitchen Butterfly, glad to have your stamp of approval! I wasn't asking, but it means loads. ;-) Thanks for the comment.